When you start a cleaning business it is important to understand three main ingredients. #1. The number of existing cleaning services in your area does not matter. There are so many cleaning services in my area. How can I compete? This is a common question. While it may seem to be true, it is very rare that a single region will have too many services. After you have been cleaning professionally for awhile, you will realize that there is a shortage of good cleaners. So why does it look like there are so many existing cleaning services? Consider the context. When I first started I walked into a cleaning-supplies store downtown to purchase my first round of cleaning supplies. Checking out, I a noticed a bulletin board with hundreds (yes, hundreds) of cleaning-business cards tacked to it. It looked like a collage. Really a work of art. My heart sank, but I pressed on. What I discovered is that a town of that size (90,000 +) could support thousands of cleaning services. Look at it this way. You only need to have 12 - 16 clients as a solo cleaner. Even a large operation only has 50 - 75 clients. Do the math! #2. You do not need to land every possible job. Twelve to sixteen customers will keep you rocking as a solo or duo cleaning company. Get the best clients possible because you may be working for them for years. The last thing you want is to get trapped with low-paying clients. Lots of cleaning business start-ups try to snap up every job as soon as possible. Now, I realize that you may need work badly, and might be impatient to prove yourself. I understand. That is how I behaved when I first started. But it is possible to achieve both: immediate work and long-term, optimized jobs that consistently pay well. You don't need to pounce like a snake on a mouse. We train you to get the best-paying jobs right away. If you have already secured a few cleaning jobs and you are still only earning $10 - 15 per hour, don't despair. Learn to phase in better jobs by applying our methods. A cleaning service can be expanded, or scaled up and out. Some business owners prefer to scale up by adding team members and setting their sights on bigger and better-paying clients. Some do a bit of research, and begin to phase in better-paying jobs with pre-qualified clients that increasingly prove to be a better fit for them and their type. 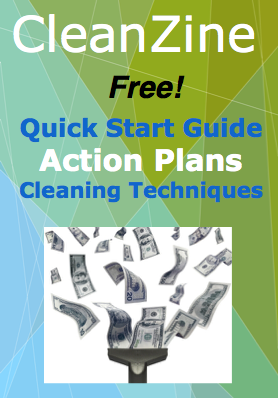 Expand your market and grow your cleaning business in a very specific and controlled way. A cleaning business is one of the best start-ups because it is flexible and simple to run. It is fairly easy to start, and not intimidating. Many professional cleaners begin by running a part-time or limited service, working by themselves or with another person. After they have learned the ropes and built speed and confidence, they put their skills to the test and go for a much bigger market. The opportunities are everywhere. Creating a cleaning business is not too difficult. With expert help, it simply takes a willingness and determination to go for it. Call your own shots and start a cleaning business of your own.